A skillful biography of one of the Civil War’s most noteworthy—and notorious—military leaders. Kennett (Marching Through Georgia, 1995) treats the military career of William Tecumseh Sherman (1820–91) with both sympathy and candor. Although, as a West Point graduate and a veteran of the Mexican-American War, Sherman was not an unlikely candidate for command, he arrived on the scene well after the Civil War had begun—when Fort Sumter fell, he was living in San Francisco and enjoying modest success as a banker and politician—and was posted far from the main theater of fighting, on the Kentucky frontier. Unlike many of his senior officers, however, Sherman brought the fight close to himself, engaging the enemy wherever he could while taking care not to subject his troops to unnecessary danger; his exemplary conduct at places like Shiloh and Vicksburg helped turn the tide of war in the West and eventually led Sherman to army-level command in the conquest of the Deep South. Kennett focuses on Sherman’s contributions, for good or ill, to the conduct of war, which included innovations such as “eating out” the countryside in a “belt of devastation” (so that enemy forces could not find sufficient provisions to pass through the same territory in pursuit), summarily executing suspected partisans and spies, and orchestrating campaigns of terror against civilian populations. (Sherman justified the last, Kennett observes, by saying, “all in the South are enemies of all in the North. . . . 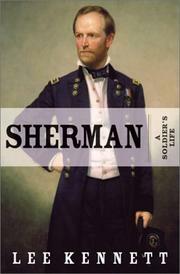 The people of the whole South are now on duty as soldiers.”) The author also notes that Sherman suffered modern consequences: apparently the victim of “narcissistic injury,” he experienced what would today be characterized as post-traumatic stress disorder and had to be pulled from the field at several points to prevent nervous breakdown. Sympathetic to Sherman but far from uncritical: a solid contribution to Civil War studies and tactics.